No panto for Wilton’s this year, though only the most ardent of Roy Hudd  fans would begrudge them this sparkling replacement, an adaptation of John Masefield’s much-overlooked fantasia that’s magical in every sense of the word. The story of a misfit trio of children swept up into a duel between two almighty sorcerers, The Box of Delights is a clear inspiration for the Narnia books of CS Lewis and even Philip Pullman’s His Dark Materials, with its clash of the everyday and the eternal. It never veers into high fantasy, instead drawing on English folklore and the mythos of Christmas-time. Adaptor Piers Torday and director Justin Audibert have done it proud here, with a show that feels suspended in the crepuscular, frozen hours of Christmas Eve. 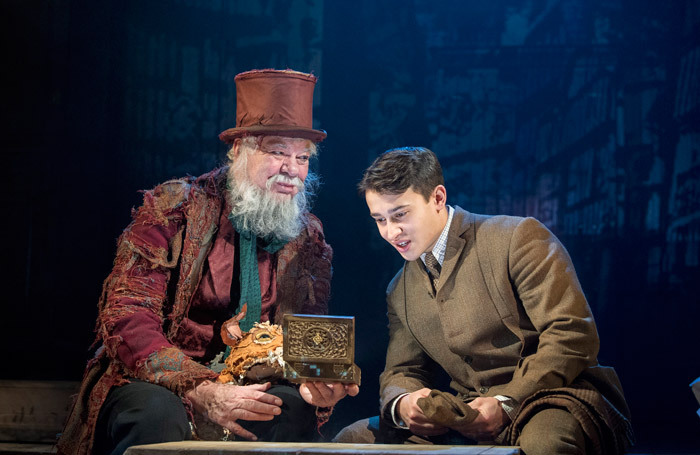 Matthew Kelly takes a year off from Dame-ing to rollick as warm-hearted wizard Hawlings, striving to protect Christmas from the scheming Abner Brown and his pack of looming wolves. There’s strong work from the younger heroes too, with Safiyya Ingar particularly magnetic as pistol-obsessed adolescent Mariah, and Samuel Simmonds giving top-class sulk as the stiff and gawky Peter. Every form of stage magic bursts out of this production, and if there’s something of a lull towards the end of an over-stuffed Act I, it all builds to a roaring climax. This is an epic children’s fantasy realised with ambition, love and care. A sparkling children’s fantasy starring Matthew Kelly as a sorcerer with a twinkle in his eye.